Coral Expeditions I is a small catamaran built for expedition cruising in Australian waters. With just 46 passengers and 10 permanent crew members, the experience is very intimate, with passengers feeling like part of a big family in no time. Although the 28-year-old ship is a little dated in some areas, it is very comfortable and looks fresh after a minor refurbishment in late 2015. At just 35m long and at just 750 Gross Registered Tonnage, it is indeed a small ship -- with a grey hull and white exterior paintwork -- but it has everything one needs. As all social activities tend to take place around the bar and dining room, it's easy to get to know fellow passengers and friendships are easily formed. The ship carries a small exploration vessel (The Xplorer) for beach and wharf landings in remote areas. While itineraries are well designed and include many out-of-the-way places, they are also very flexible; being aboard a small ship means the captain can change direction and explore other areas if the weather and seas prove unsuitable. Expect smooth sailing in the bays and inlets and when the open seas are calm. Like all three ships in the fleet, Coral Expeditions I has an open bridge policy, meaning passengers are free to enter this area on Deck A at any time and watch the captain and his crew at work and also ask questions. While a Coral Expeditions cruise best suits those who love an adventure and are reasonably fit, there is no requirement for passengers to join the shore excursions, which usually take place twice daily. Guest lecturers and experts are onboard each cruise; these may be marine biologists, geologists, national parks rangers or others with specific knowledge of the destination. A journey aboard this ship is focused on the destination and learning about it in depth. There are few onboard activities beyond talks and video presentations, which take place in the small lounge; most of the real action talks place on land, in the ocean or under it if you're a diver. As most passengers make the most of their explorations by day, they look forward to a good night's sleep before the next day of adventure begins. There's really no nightlife aboard the ship; evenings are spent enjoying pre-dinner drinks and chatting over dinner. Mind you, there are always a few folks lingering around the bar after dinner, keen to recap the day's events. 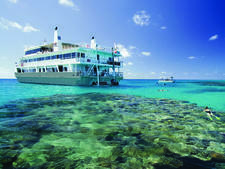 As Coral Expeditions I operate 10 and 11-night cruises in the Kimberley and an 'over-the-top cruise' from Darwin to Cairns, expect to be mingling with an older crowd. These longer itineraries attract passengers with time on their hands. There will be a mixture of retirees, semi-retirees and a sprinkling of younger folks taking their annual holidays. The majority of guests will be Australians, although these off-the-beaten track journeys also appeal to travellers from Britain, Europe and America keen to see the reef and outback in comfort. Whatever the nationality or demographic, the typical Coral Expeditions passenger loves to explore the destination. 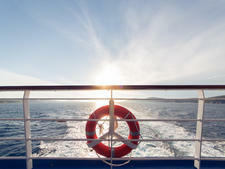 Many passengers will be those who only ever travel on small ships. They will be generally well travelled, well educated and financially comfortable although they are not necessarily luxury-seekers. 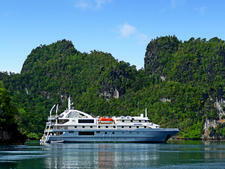 About 70 per cent of Coral Expeditions' clientele are repeat passengers. All announcements and information are in English. There are few facilities for children, although kids do love the snorkelling trips when the ship visits the Great Barrier Reef. Casual is the key word aboard any Coral Expeditions' cruise. In fact, the company says there is "no dress code". Most passengers tend to wear casual adventure wear or swimming gear during the day and then change into smart casual attire for dinner. Elegant/cocktail clothing is not required, although passengers may want to dress up a little more for the Captain's welcome and the farewell drinks. Tipping is not required nor expected. However, if passengers do want to recognise good service, they can pass on the gratuities to the purser who will distribute it equally among the crew. Australian currency is used onboard. Fit for adventure seekers, the 72-passenger Coral Discoverer features a purpose-built expedition tender, an onboard scuba diving department and both single and double kayaks.